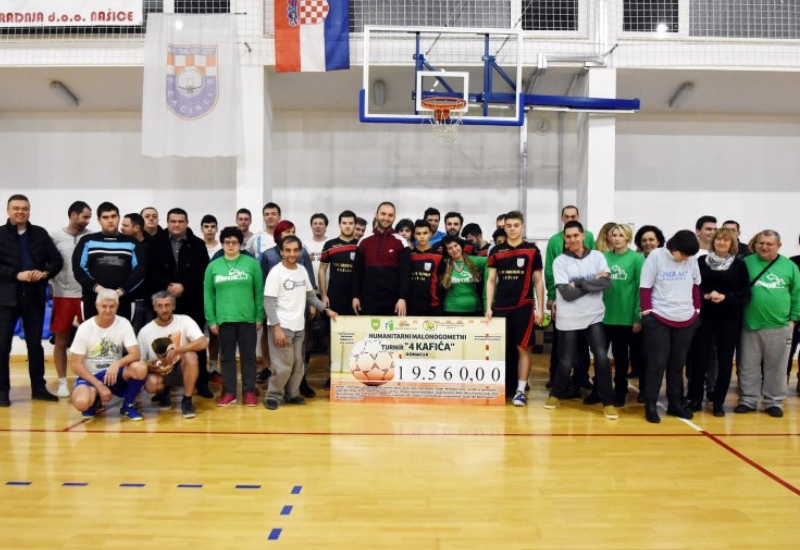 The already traditional tournament brought together companies and individuals from Cacinci, Croatia in the sports hall of Antun Gustav Matos school. A total of around EUR 2,6000 (KN 19,660) was raised in support of Jaglac, an association of people with disabilities from Zagreb. Football and kindness go well together, which was recently also demonstrated by the members of the Croatia football representation, who donated EUR 60,000 for a children’s hospital and children without parents, as part of their Heart of Fire Foundation (Zaklada Vatreno srce). However, football and kindness are already a tradition in Cacinci, as on 7th January the 6th charity tournament was held. The general sponsor of the tournament was the company Pan Parket Cacinci, and matches were played by the cafes Bum and Def, as well as representatives of Cacinci Municipality and RU-DA Service. The youngest generation of players from the Football Club Youth (FK Mladost) also played a match, in between the semifinals and finals. At the end of the event, members of Jaglac also stepped out on the court and received a check from the representatives of Pan Parket. “What speaks the loudest perhaps is this group thank you that our Jaglac members shouted out, when they received the check. We thank the Tourist association, the Municipality, Pan Parket and all the teams and these wonderful people from the bottom of our heart. Your gesture has moved us to tears and this really means a great deal to us”, said Djurdja Simatovic, President of Jaglac. Jaglac brings together people with disabilities and their families. The association runs various types of projects and activities which have to do with promoting equal rights for people with disabilities, developing and improving policies for children and young people with disabilities, securing social services and supporting families that have children with developmental disabilities in the process of their integration into the regular educational program. The association was found in 2002 and today has over 100 members, including volunteers which provide vital help in the work of this organization.